04:42 to 14:02: Delicate Newbies – from listener Dan – How to act against obviously newer/weaker players? : Sometimes people see newbies and pull their punches. Sometimes they go all out. How should we encourage people to treat newer players who’re shuffling up their first CMDR deck? Don’t pull your punches in-game. Try using good, but not overpowered decks that naturally restrict your ability to dominate the game. Keep an open mind about their card selections. Let them durdle around with bad cards they want to use and let them figure out what works and what doesn’t with gentle tips and insights regarding similar cards that are a lot better. Akido style decks that scale to your opponent work pretty well when you need a single deck to handle multiple power levels. 14:22 to 35:41: STAPLES: That Was Easy – A lot of cards are considered “staples” or auto-includes in certain builds. 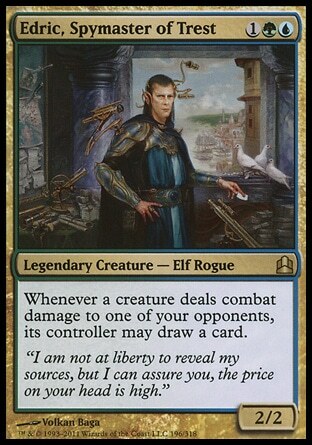 Rather than beat a dead horse about whether we can/should consider something to be a staple, we’re going to define what we feel a staple is and discuss whether or not they’re good for the format as a whole. 36:08 to 51:57: Deck Round-up – Andrew’s Edric Enchantress deck: Ever since the pre-cons came out, Edric’s been a staple in several metas. He’s a huge advantage engine at your beck and call, and was one of only three G/U commanders for the longest time. How do you stop him, how do you play him, and what makes him tick? We discuss! 52:43 to 1:03:50: Where the Contract Ends – This segment is going to be about deck building, and debating which way to take a deck. For this one, we’re helping Andrew decided whether he should build a “group hug” Edric deck, or a sluggy “stacks” build. Both are very powerful, but which one’s going to keep the game store from throwing him out into the cold world? 1:04:23 to 1:36:24: Secret Technology – Undiscovered Tech: We don’t normally talk about newer cards, but part of the fun is discussing the new stuff that comes out, so we’re gonna do it anyway! We’re each going to talk about some lower profile cards that we think will make an impact in our decks (LOW profile means cards that a bajillion other blogs aren’t talking about, particularly ones for standard/modern/legacy). 1:36:54 to END: Outtro: Thanks for listening!